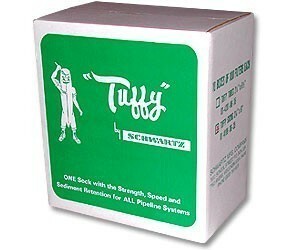 Tuffy Filter Media is a multi-purpose non-woven material designed to have the strength, speed and capacity to function efficiently in vacuum, gravity and low or high pressure pipeline installations.2-1/4" x 6" Tuffy Socks for Universal, Perfection, and Marlowe. 100 per box. Case of 10 boxes. Wt. 8 lbs.